MELBOURNE, Fla. -- Just four weeks into his administration, President Donald Trump appeared at a campaign rally that mirrored the months leading up to Election Day, complete with promises to repeal the health care law, insults for the news media and a playlist highlighted by the Rolling Stones. Insisting he was the victim of false reporting, Trump said his White House was running "so smoothly'' and that he "inherited one big mess.'' The president has been trying refocus after reports of disarray and dysfunction within his administration. And he's also had to contend with crowds of protesters. Thousands of them were out on the streets of Dallas and Los Angeles to oppose immigration enforcement raids and to support immigrants and refugees generally. In Los Angeles, an organizer urged local authorities not to spend money on immigration enforcement. First lady Melania Trump introduced her husband at the rally, reciting the Lord's Prayer before offering her own pledge to act in the best interest of all Americans as she pursues initiatives she says will impact women and children around the world. The event had the familiar trappings of a Trump campaign rally, including red Trump caps, "Make America Great Again'' and "Trump/Pence'' signs and at least one sign reading "Hillary for Prison.'' Some of the speakers ahead of Trump's appearance called for repealing and replacing President Barack Obama's health care law, criticized the news media or lobbed barbs at Clinton, other constants of last year's rallies. 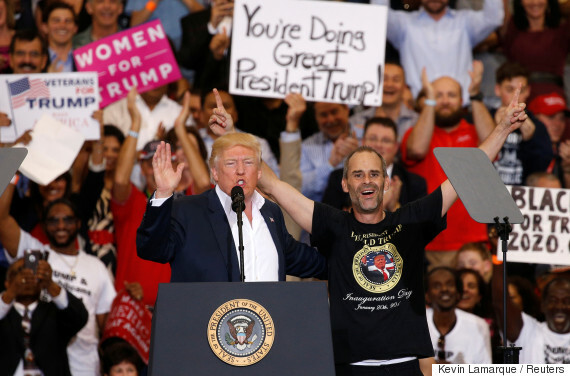 The music playlist preceding Trump's appearance included rally favourites like Free's "All Right Now.'' As Air Force One rolled up to the hangar, the theme to the Harrison Ford movie "Air Force One'' signalled its arrival. Trump and the first lady appeared as Lee Greenwood's "God Bless the U.S.A.'' played. And his 45-minute remarks were followed by another 2016 campaign favourite, the 1969 hit "You Can't Always Get What You Want'' by the Rolling Stones. The rally came during Trump's third straight weekend at his private south Florida club, Mar-a-Lago. It was another working weekend for the president, who planned to interview at least four potential candidates for the job of national security adviser, a position unexpectedly open after retired Gen. Michael Flynn's firing early this week. Trump had also expressed interest in former CIA Director David Petraeus, but Spicer said Saturday that Petraeus was not a finalist. The retired four-star general resigned as CIA director in 2012 and pleaded guilty to one misdemeanour charge of mishandling classified information relating to documents he had provided to his biographer, with whom he was having an affair. Flynn resigned at Trump's request Monday after revelations that he misled Vice-President Mike Pence about discussing sanctions with Russia's ambassador to the U.S. during the transition. Trump said in a news conference Thursday that he was disappointed by how Flynn had treated Pence, but did not believe Flynn had done anything wrong by having the conversations.